Ready to start creating your own printed materials? Choose a template from the catalog. All the design work is done. All you have to do is fill in your text in the indicated areas and upload any pictures you might like to include. It's that easy. We will then do the printing here in our shop and ship your items to you. 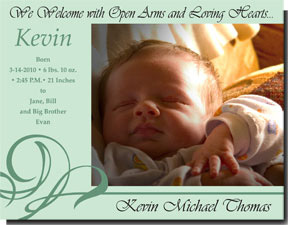 This 5.5 x 4.25 inch customizeable announcement is created with your own photo and personalized wording. Giving you the perfect way to tell your family and friends about the birth of your child. The cards fit a standard A2 envelope.